Health and wellness for your dog often consists of a few well-defined things. Good food, fresh water, plenty of exercise, proper veterinary care and something really good to chew on tend to be the basic requirements indicated by canine professionals. But many dog owners know there is another vital component necessary for canine well-being: a strong, safe connection to a pack or family. That human-canine connection and bonding is what Brenda Bryan was working toward when she developed dog yoga (or Doga) in collaboration with the Seattle Humane Society a few years ago. Doga is partner yoga with a very special, furry partner. Doga consists of poses such as Woofing Warrior, Pit-to-Paw Standing Twist and Canine Crunches, to name a few that engage both person and dog. Dogs of all shapes and sizes are welcome, including those you might think would have difficultly staying on the mat for the length of class. Frequently, owners voice concern that their dog is not calm enough to attend a yoga class. Yet, Bryan said that the very practice of Doga often calms these sorts of dogs. While Doga might be a bit unnerving at first, most dogs come to really enjoy the experience. Even dogs that are less-than-perfect with other dogs can benefit from the class. Bryan allows these “dogis” a little extra space away from other classmates so dog and owner feel comfortable and safe. In fact, many owners report their dog is eager to come to Doga class the next time around. From Chicago to New York and Santa Barbara, Calif., dog yoga has popped up as a phenomenon in cities across the United States over the last few years. Most recently, a studio in the Sheung Wan district of Hong Kong began offering Doga, so it is not just in the United States where people are looking for a new way to connect with their canine friends. Many Doga practitioners remind us that dogs have been doing a kind of yoga, specifically Downward Dog pose, for eons and many of the Doga poses come naturally to dogs. Even yoga-mat companies have become hip to the trend by offering yoga mats with dog (and cat) paw prints, but, of course, the mats are good for any yoga class. As Seattleites, we are lucky to have Doga classes close by. Bryan teaches Doga at the Seattle Humane Society once a month ( seattlehumane.org). 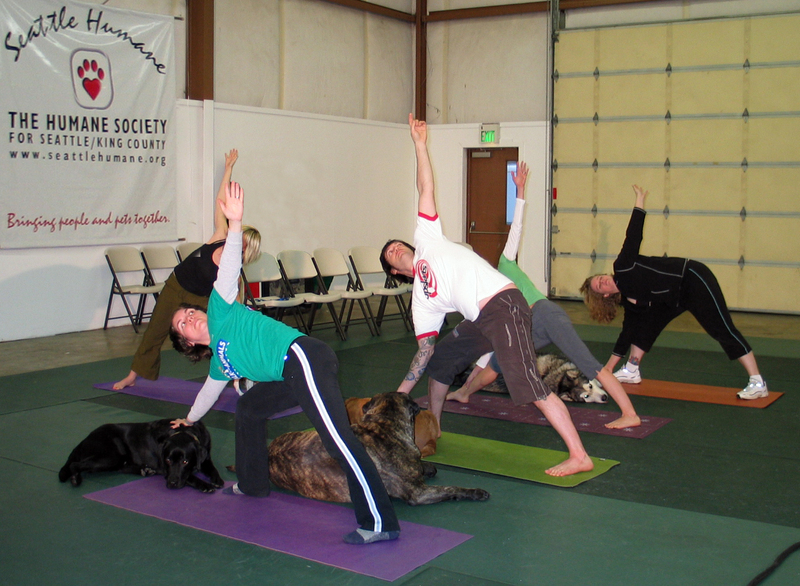 Spokesperson Joyce Zoldak said that the Seattle Humane Society began offering the Doga classes because they felt it would be a fun and relaxing activity that is good for owners as well as their dogs. “The dogs love it just as much as the owners,” Zoldak said of the positive feedback she gets from the human Doga attendees. 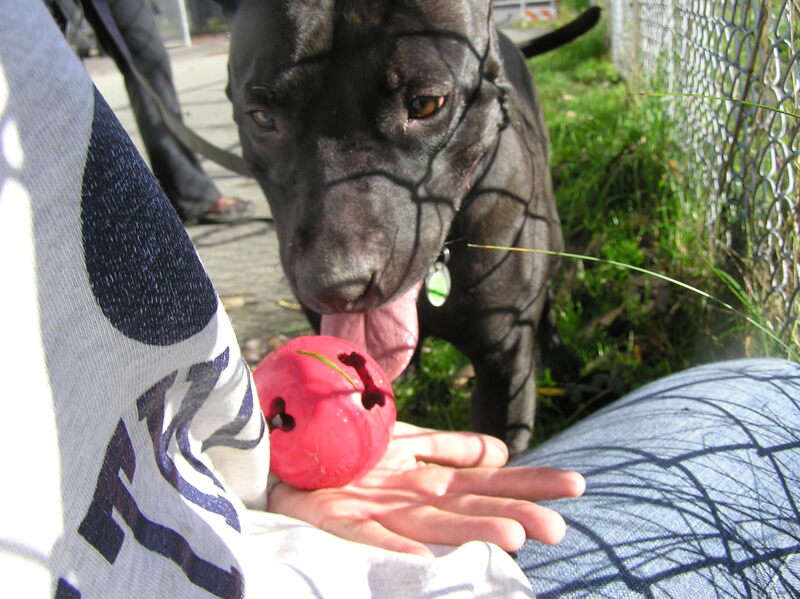 Seattle Humane Society Doga classes are open to the public. Bryan said that dogs recently adopted may particularly benefit from Doga as they learn to bond with their new caretakers. 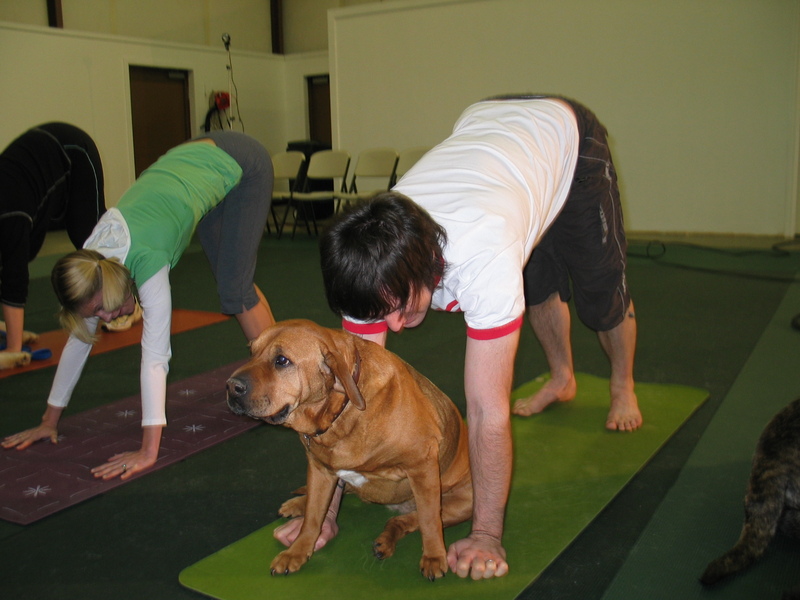 Doga classes are also offered at the Ginomai Community Center in West Seattle on alternating Saturdays. See the Barking Buddha blog at dogyogablog.com for more information. In addition, a book or video about Doga can help you get started at home. 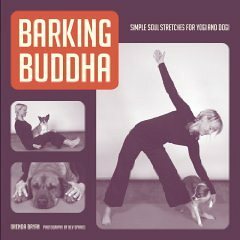 Bryan’s book, “Barking Buddha: Simple Soul Stretches for Yogi and Dogi,” is available through Amazon or at the Seattle Public Library. Because of the recent popularity of Doga, videos can be found on-line, as well. CHRISTIE LAGALLY is a freelance pet columnist who manages the website “Sniffing Out Home: A Search for Animal Welfare Solutions” at http://www.sniffingouthome.org. 1) Check out the Best Friends blog post, A Myth-Buster of a Day. 2) Got puppy mills? Well consider the fur industry which is a horrible puppy mill for wild animals. Being ‘fur free’ isn’t even a lifestyle change, since faux-fur is easy to find. Sign the petition on Care2 to encourage the fur ban movement. It does work. West Hollywood has banned the sale of fur in city limits. Yeah!!! People really do care about animal welfare. 3) Check out your local ‘Occupy’ movement and find what’s up! Here in Seattle the Occupy rally has a working group for Animal Rights and Environmentalism. 4) Send a letter (don’t worry, it’s an easy online form) to your local lawmaker to encourage them to pass legislation for free-range egg production. November 6, 2011 · Filed under Uncategorized	· Tagged animal welfare, animal welfare legislation, Occupy Seattle, Occupy Wall St. If we ever needed evidence that we are not alone in our fight to pay our bills and, furthermore, to struggle through the everyday maze that it is to move through our world of injustice, we certainly got that reassurance on Bank Transfer Day. This is the power we have to reshape our world! This is where it starts – for the 99% of people and the 100% of animals too. Everyday the tragedy of factory farming, pet homelessness and cruelty are among us. At times our footsteps feel small, and traction is fleeting. But Bank Transfer Day wasn’t just about money — as you already know. It was about the power to change our destiny by walking away from injustice and participating in the alternatives. If the 99% walked away from pet stores selling animals, there would be no more puppy and kitten mills. If the 99% walked away from commercial meat sales, there would be no more factory farming. If the 99%, banned exotic animal sales, there would be no more wild animal trade. But it is no longer an “if” we walked away, because we “are” walking away. You have the choice, and Bank Transfer Day showed how much that choice matters.